Consumer-focused file sync and share (CFSS) solutions have become one of the most popular categories of applications used in the workplace over the past few years. However, while there are good reasons for employees to use CFSS systems, their use significantly increases corporate compliance risks, legal costs and puts a significant proportion of corporate content outside the control of IT and others charged with managing it. 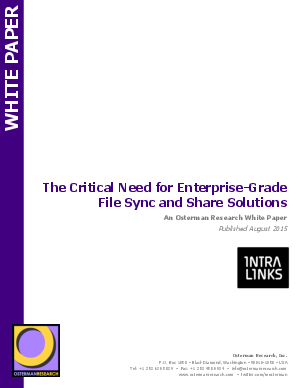 To mitigate these risks and lower the costs of managing corporate information, organizations should deploy enterprise-grade file sync and share (EFSS) solutions as replacements for CFSS systems.